Top 3 Fattest NHL Salaries: Are They worth It? Shea Weber of the Nashville Predators is this season’s highest paid player. He is set to make $14,000,000 this year. The team captain and a tremendous defenseman for the Predators, number 6 is number one on our list. He inked a 14-year, $110 million contract in 2012. The 6’4” 233lb Canadian is 29-years old. Does anyone expect him to be crashing the boards at 39 when his contract expires? Apparently the Predators can see that happening. So far this season Weber has played in 18 games and has 5 goals and 6 assists for a total of 11 points. He is +11 which is 8th in the NHL. “How is his team doing” you ask? Nashville is 12-4-2 with a stout 26 points. They are currently atop the Central Division of the Western Conference. They are on a 2-game winning streak most notably including a 9-2 pounding of the Toronto Maple Leafs in Toronto. Weber notched 3 points on 3 assists in that blowout, and registered 4 hits. He is currently 4th in the NHL in TOI (time on the ice) averaging 31.1 shifts and 27:01 minutes per game. The case can be made that Shea Weber is deserving of his $14 million salary. The team is hot and he is contributing in a big way and playing a lot of minutes. Could he finally capture the elusive Norris Trophy this year? I wouldn’t bet against him. Enjoy some highlights from last year. As a fan, do you feel Shea Weber is worth the money? Sidney Crosby of the Pittsburgh Penguins is this season’s second highest player. “The Kid” is considered by many to be the elite of the elite in the NHL. Can we still call the 27-year old Canadian “The Kid?” The reigning Hart Trophy winner signed a 12-year, $104,400,000 contract last year. He will make $12,000,000 in 2014-15. Is he worth it? At the pace he is accumulating points, some think it’s a matter of time before records fall to Crosby. Another crazy Crosby thing since it's 2:30am: Crosby has 794 career points. Peter Forsberg had 885. Crosby could pass Forsberg this season. Crosby’s impact on the sport was immediate when he came on the scene in 2005. In this his 10th season with the Penguins, Captain Sidney Crosby is on pace for another solid season. He has 8 goals and 18 assists for 26 points – currently 1st in the NHL. He is a +3 and his team is currently in 1st place in the Metropolitan Division of the Eastern Conference. At 13-3-1 and 27 points, Pittsburgh is leading the way in their division. Sidney Crosby is on everyone’s list of the “best in the game.” He is still relatively young by NHL standards, but he does have a Stanley Cup under his belt. Pittsburgh Penguins fans are grateful, but some are wondering if or when Crosby will lead their team back to another Cup win. 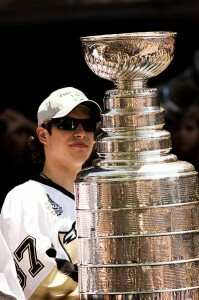 With a surrounding cast of Evgeni Malkin and Marc-Andre Fleury, it is a reasonable question for the fans. So I ask you, is Sidney Crosby worth the $12 million? The list of highest paid NHL players differs on number three. Capgeek.com lists Zach Parise of the Minnesota Wild at number three, as does fansided.com. Spotrac.com however lists Ryan Suter as the third of the highest paid NHL players. He, too, plays for the Minnesota Wild. Both players are set to make $11,000,000 this season so does it really matter? We’ll slot them both at number three. Let’s look at both players and see if the Wild are getting their money’s worth. Zach Parise is a 30-year old from Minnesota. He plays on the wing for the Wild and is widely regarded around the NHL as an elite player. He has only played in 12 games this season but still has managed 6 goals and 6 assists for 12 points. He is a +8 but his team is currently in 4th place in the highly competitive Central Division. Their current 20 points would likely not get them into the playoffs if the brackets were announced today. In 2001-12 Parise notched 69 points with the New Jersey Devils and the Minnesota Wild had to have him. They went “wild” in free agency and signed Parise and Suter both to 13-year, $98.000.000 deals. In two seasons with Minnesota, Parise has registered 38 and 56 points respectively. Not bad on the surface, but is it enough to bring a Stanley Cup to Minnesota? He sustained a concussion against the Pittsburgh Penguins on November 3rd and missed five games. Not known as injury-prone, Parise should bring a lot of offense and spark to this Minnesota team that needs to earn a lot points. In the West and especially in the Central, points are at a premium. You tell me, is Parise’s $11 million this season going to be money well-spent? Is he worth it? The 29-year old from Wisconsin is also an alternate captain for the Minnesota Wild, and is an excellent defenseman. Thus far he has 1 goal and 8 assists for 9 points in 17 games. He is currently a +10 which is 15th in the NHL. Formerly with the Nashville Predators, Suter was grabbed by the Wild in 2012 along with Parise. Ryan Suter, also, is putting in his time on the ice, currently ranked number one in TOI at an average of 29:13 in 31.2 shifts per game. As mentioned, he is going to earn $11,000,000 this season. Is he worth it? Craig Custance of ESPN seems to think so, as he wrote on October 28th that losing Ryan Suter would be “devastating for the Wild.” Enjoy this Suter hat trick from January 2014 against the Washington Capitals. If you are a Minnesota Wild fan, you are probably excited to see Zach Parise and Ryan Suter on the ice. These are guys who legitimately give your team a chance at getting into the playoffs as they did last year and possibly beyond in the near future. But, at the end of the day, are they worth a combined $22 million? There you have it, hockey fans. Four guys making the top 3 fattest NHL salaries – a combined $48,000,000 this year. I’d like to know how you feel. Are they worth every penny? Or are they an overpaid bunch who really will not make a difference to their team in the end? Leave a comment below and let me know how you feel.